If lines are long at the Venice railroad station's Bagagli Deposito office, you can save time (and possibly money) nearby. 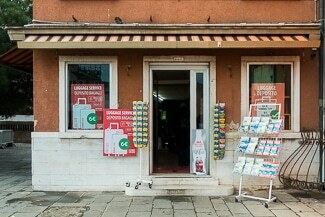 ABOVE: The front entrance to the luggage office faces the Geand Canal by the Venezia Santa Lucia Railroad Station. 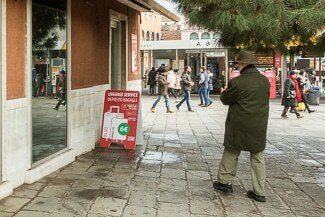 The Deposito Bagagli office in Venice's Santa Lucia Railway station is convenient if you need to store a suitcase for the day, but waiting lines can be long in the summer or on busy weekends. To avoid the crowds, head for the privately-owned storage office next door to the station. 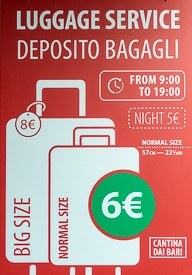 Rates tend to be slightly cheaper (at least for smaller bags) than at the station's own Deposito Bagagli office, although hours are more limited: 9 a.m. to 7 p.m., compared to 6 a.m. to 11 p.m. at the station. If you're leaving bags overnight, and especially if you have a large bag, the station may be a better bet. Do not exit through the crowded station lobby. Instead, use the archway just beyond Track 1, on the left side of the station as you leave the platforms. 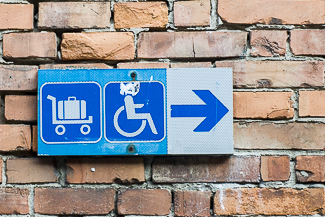 This will lead you to a gentle paved ramp that is friendly to wheeled luggage, strollers, and wheelchairs. As you near the bottom of the sloping path, you'll see a sign for "Luggage Service/Deposito Bagagli" on your left, outside a storefront on the station square. Go inside. Checking your luggage is easy: Just drop off your bags at the cashier's desk inside the shop's entrance, where you'll be given a receipt.